In 1926, Irving Berlin famously wrote of “Blue skies, nothing but blue skies …” in his still-popular song, written for the short-lived musical Betsy. The song was more popular than the show, and in the 1920s Blue Skies was one of the most recorded and sung songs in America. In 1927, the music was published and soon became one of the first songs featured in a talkie, when Al Jolson performed it in The Jazz Singer. The fact that Berlin, who was born in Belarus and was the son of the cantor, and that Jolson’s Jazz Singer character is trained as a cantor, seems hardly coincidental. If you slow down the tempo of “Blue Skies” and imagine a melancholy plaintive voice singing Hebrew words, the song recalls synagogue melodies. And of course, The Jazz Singer, which was adapted from a Samson Raphaelson short stories titled “The Day of Atonement,” features several scenes in Orthodox immigrant shuls. Amazingly, Jolson was born Asa Yoelson in Lithuanian Srednik (Yiddish: סרעדניק‎) now Seredžius, near Kaunas. The small shtetl is only 14 kilometers – today a 20 minute drive – from Cekiskes, home to many Burlington Jews, who we suspect closely followed Jolson’s amazing American career. So what does this have to do with the Lost Shul Mural? In wintry Burlington, blue skies are not always easy to find, but in the teens and 1920s worshippers at the little Chai Adam Shul could have looked up daily to see their own version of blue. Though we have no photographs that show the painted ceiling of the synagogue, we know from descriptions and recollections that the ceiling was painted blue, and adorned with angels and instruments. Mark and Harriet Colodny Rosenthal were filmed visiting the mural (for the Vermont Public Television documentary Little Jerusalem.) Mark remembers “that the ceiling was blue and there were violins painted, and trumpets, the cherubs, it was light blue ceiling …” Harriet recalls attending the synagogue as a young child in the 1930s: “[the paintings were] like magic, it was just like magic …when I was sitting back there, and looking up at the blue sky, that’s the only time I sat quietly in the synagogue.” Quite likely the sky blue was bright and light in tone, similar to a blue fond painted on the apse plaster beneath some of the mural. Assuming there was no artificial ceiling illumination in the shul, a light blue ceiling would have reflected some of the natural light entering the sanctuary from side windows, filtered over the women’s gallery. Congregation Agudath Shalom (the Walnut Street Shul), Chelsea, Massachusetts. source: Walnut Street Synagogue. Congregation Sons of Israel, Providence, Rhode Island. Source; Sons of Israel. Perhaps we can get some idea of the appearance of the Chai Adam ceiling sky from two other New England Orthodox shuls that still survive – Congregation Agudath Shalom (the Walnut Street Shul) in Chelsea, Massachusetts; and the Sons of Jacob Synagogue in Providence, Rhode Island. The Walnut Street Shul, was erected in 1909. The architect was Harry Dustin Joll. 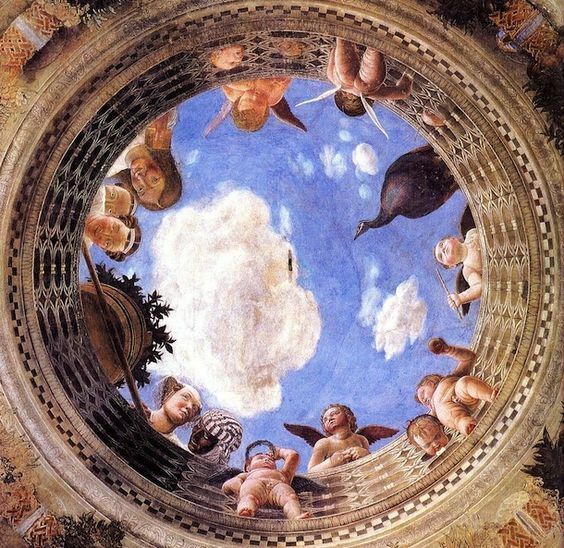 Subsequently, immigrant artists painted the walls and ceiling. The ceiling is remarkable similar to that painted at Congregation Sons of Jacob Synagogue in Providence in the 1920s or 1930s. Founded in 1896 on Shawmut Street and now located on Douglas Avenue, Sons of Jacob is the oldest orthodox Jewish congregation in Providence, and the only synagogue still in use in the historic Smith Hill neighborhood. The ground floor was built in 1906 and the sanctuary was designed in 1922 by Harry Marshak. From 1923 through 1936 Congregation president Sam Shore oversaw the decoration of the sanctuary, apparently painting some of the work himself, such as the Zodiac signs which surround the large central field of the ceiling – a open cloud-streaked sky. How many other American shuls had ceiling painted as open skies? We do not know, and the documentation of the immigrant shuls – those destroyed and those still standing is just beginning. The Lost Shul Mural Project is partnering with other institutions and organizations to expand our knowledge of this little remembered aspect of American Jewish life.